Do you hit your putts off the intended line, too often? We have something for that. PuttStraight is a unique device that will improve your putting and chipping direction and distance. PuttStraight is an extremely accurate putting and chipping stroke motion analyzer providing immediate continuous feedback for the pointing direction of the club face (how much open or closed) and length of the backswing. It’s immediate because there is no electronic calculation involved—the results are continuous in real time and without hesitations. 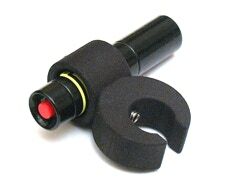 A laser light on the putter beams a red dot at a target on any convenient wall. The laser dot moves when the club moves. Open the face—the laser dot moves right. Close the face—the laser dot moves left, for a right hander. Make a stroke and the laser dot moves down on the back stroke and up on the forward stroke. First the golfer aims the laser at a target on the wall while in address position. A stroke or swing is made. The laser dot descends on the backswing and then rises on the forward stroke, and passes near the target with some degree of error. The error is the directional error resulting from opening or closing the club face during the stroke. Every little wobble of the club face shows up very clearly, throughout your stroke. You or your golf teacher have to notice which part of your body causes the error. For distance training, just watch how far the dot moves down on the wall during the stroke. The longer the backswing, the lower the dot dips. Because backswing length is a major factor in club head velocity, it is worthwhile to choose the length of the backswing. You can make up exercises. For example, repeat a given length. Another is to make slight increments in length. Backswing length is difficult to measure without some device. With PuttStraight, you get an immediate and accurate way of measuring various backswing lengths so that hopefully when you get on the green you can choose the right back swing length for every putt. 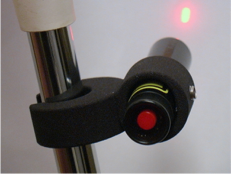 There are various ways to monitor the laser dot. 1. watching directly the laser dot on the wall (like Jordan Spieth watching the hole on a short putt), or 2. by watching the laser dot through a mirror placed by the club head (a common cosmetics mirror is fine), and 3. stand close to the wall so you don’t have to turn your head to see dot. PuttStraight weighs only 37 grams. It’s placed near the hands so you don&apos;t notice the weight. It works for putting, chipping, and short pitches. Full swings are too fast to see. Beside being more accurate, it&apos;s about five times faster than real putting, and you don&apos;t have to fetch and place golf balls and watch where they go. It also works for having fun with your cats or dogs. The PuttStraight comes with instructions and a wall target. To read the instructions now, use this link.